Milwaukee Hand Trucks is the trade name for products manufactured and sold by Gleason Industrial Products and has become the name that the professionals trust. 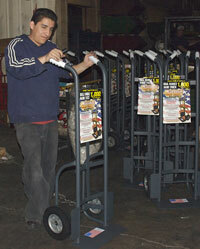 Milwaukee Hand Trucks are produced in Gleason�s manufacturing facilities in Goshen Indiana and Lincoln Illinois. Using high quality raw materials, efficient manufacturing processes and a highly dedicated and skilled work force ensures that the Milwaukee Hand Trucks brand name is synonymous with quality, durability, reliability and fair value. With more than 60 years of experience in manufacturing, The Gleason Group is committed to producing and maintaining professional quality products and offering unsurpassed service to our customers. To find out more about the Gleason Group of Companies and their products, please click on the logo.